Seven times an Open Championship venue, Carnoustie was the penultimate Scottish golf course added to the Open Championship rotation – Turnberry was the last. Carnoustie is a big natural seaside links and is widely considered to be one of the world's most difficult golf courses. In fact, according to the results of a recent Top 100 survey, Carnoustie is the toughest golf course in Britain & Ireland. The first record of golf being played across this links land dates back to 1527; a 10-hole course was laid out in 1842 by Allan Robertson. Fifteen years later, in 1857, an 18-hole course was fashioned by Old Tom Morris. James Braid extended the course in 1926 and it has hardly changed since. The main A930 road passes through the town in an east-west direction, running parallel to the railway line as it approaches the town centre. Shortly after turning off the main drag, the road narrows considerably and you’ll cross under a litle railway bridge, allowing you to reach Links Parade and the car parks next to the hotel at the back of the 18th green on the Championship course. Much has been written about Carnoustie over the years. The finishing holes are especially brutal at this seven-time Open Championship venue and many consider that it has one of the greatest back nines in championship golf. 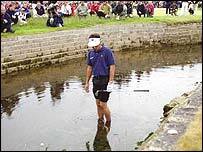 Others will recall John Van de Velde’s barefoot paddle in the Barry Burn at the 18th hole during the 1999 Open Championship. Bernard Darwin perhaps had Van de Velde in his mind when, in 1910, he wrote in his book The Golf Courses of the British Isles: “he had got burns badly on his nerves… there really is some justification for the nervous golfer who has water on the brain after a round at Carnoustie.” You have to cross the snaking burn no less than five times whilst playing the closing two holes. We mustn’t forget to mention wee Jockie’s Burn—the young son of Barry—he comes in to catch your approach shot to the 3rd green. In addition to burns, Carnoustie has some of the most formidable bunkers to contend with. There’s a plethora of them and some are alarmingly cavernous. The par five 6th measures 520 yards from the white tees and is regarded as one of the world’s best holes. Named, “Hogan’s Alley”, after the immortal Ben Hogan who won the Open Championship in 1953. Two fearsome looking bunkers lie waiting in the middle of the fairway and a third bunker to the right hand side ensures that the tee shot is daunting. The 15th, 16th and 17th are considered the world over to be three of golf’s very best closing holes. “Lucky Slap”, the 15th, is a 460-yard par four, where the fairway slopes from left to right into the path of two waiting bunkers and the approach shot must avoid a cluster of three bunkers sited to the right of the green. “Hardest par three in golf; downwind it is difficult, into an easterly wind it is practically impossible”, according to the yardage guide. We won’t argue because the 16th, called “Barry Burn”, measures 245 yards from the white tees; for the ladies it’s a short par four measuring 212 yards. The 17th is a complete conundrum, called “Island” because the Barry Burn snakes in front of the tee and then loops back, cutting across the fairway. Into the prevailing wind, it is tough to know what to do on this brutal 400-yard-plus par four. After winning at St Andrews and Royal Liverpool in 2005 and 2006 respectively, Tiger Woods was chasing a rare treble. He tried to emulate Peter Thomson (1954-1956) by winning a third consecutive Open Championship at Carnoustie however Padraig Harrington had different ideas, claiming his first Major title pushing Woods back to 12th place in the 2007 Open Championship. Carnoustie isn’t the most scenic golf course—rarely do you catch sea glimpses—but it is incredibly tough, even from the forward tees. Bring your “A” game here and pray for the weather to be kind. But be aware that should you plan to play Carnoustie in the winter (Nov-Mar), mats are required on the fairways and the first cut of rough. Mackenzie & Ebert made recent changes to the 3rd hole on the course, where we have created fairway to the right of reconfigured central bunkers to tempt golfers into being more aggressive from the tee. Previously, the only option was really a 6-iron shot to the corner and then a pitch to the green in stroke play though a few players tried to drive the green recently in The Amateur match play stages. Carnoustie. One of my favourites, flattish no spectacular scenery but you are there for the golf which is testing from the very start. Excellent design because as you progress around the course it gets tougher closer to the finish by which time you should be well warmed up. You need to plot your way around while # 6 Hogan’s Alley is a thrill to play. He drilled his four drives into the gap between the out of bounds and the bunkers on his way to win the Open in 1953- this line will give you a better approach to hit the green in two! However you probably won’t tee off beside the tee with the plaque. There are many holes on which you can score while you travel round the horseshoe shaped course which has two par threes and four par fives the most spectacular of which is the ‘Spectacles’. The last three are very testing so you should score early and often. Most greens have an extended ‘tongue’ which makes them long so note where the flag is as indicated on each tee box. The long par three 16th is called the Barry Burn (stream) which is not in play here but does weave its way round the course and appears with devastating effect elsewhere particularly on 17th ‘Island’ and 18th . What a tough course, add the wind and over 100 bunkers. The back is much tougher than the front. I am not sure how they structured it so that most of the last holes are into the wind, but…..Spectacles, the 14th is one of the toughest holes in the world at 461 yards along with its famous bunkers, not to mention the pot bunkers. The 15th, Lucky Slap, is almost as tough at 459 yards.. On the second one I hit a good drive, a better 5 wood and a solid 8 iron to get to pin high! Sank the putt, too! The 16th was 245 yard par 3 into the wind. My playing partners thought I would be intimidated by this, I said this was nothing compared to Crail’s Balcomie as I did not have to worry about clearing a cliff. Number 17 is called the Island Hole, due to the Barry Burn. This stream starts on the right side of the fairway, flows towards the tee and then down the left side. It then meanders diagonally across the fairway to the right, effectively cutting the fairway in half. Surprisingly, this was the easiest of the last 5 holes (downwind) at only 433 yards, simple driver and then a 5 wood. Of course, you need a little luck to not end up in the Barry Burn as its sole purpose seems to be to confuse golfers and gobble their balls. As for 18, we all went back to where Van der Velde’s gaffe started, shook our heads and then walked up to the front tees. Still at 444 yards into the wind with water in front not an easy hole. For me, driver, 5 wood short of the water, a pitch and I sank the putt for a smooth 38 on the back. Those last 5 holes can bring you to your knees. One of the guys I was playing with was 4 over after 13 and his best score on any hole going in was a double. Carnoustie is unquestionably a brilliant golf course. The opening six holes is exactly my type of golf and it sings a wonderful tune with just the right amount of natural land movement. And in conjunction with the correct balance of demanding and daring shots it hits the perfect notes from the off. The opening hole is superb in every sense as is the difficult second with an amazingly long green. The third gives options from the tee and the putting surface at the fifth is unbelievably good. Then you have the famous sixth hole "Hogan’s Alley" with out-of-bounds tight left and bunkering to die for; just a shame they weren’t really in play for us! The same can be said of the wonderful closing stretch from the 13th onwards which is simply a fantastic succession of classic holes. As you would expect the robust championship demands are a little bit more dominant and these are gradually ramped up to a blistering crescendo. The two brawny closing holes at Carnoustie are etched into golfing history and require no further explanation except to say the use of the Barry Burn is as fantastic as it is daunting. You are continually dicing with disaster but despite the unceasing interrogation there's an absolute fairness to it all. I can’t quite wax as lyrical about the middle part of the course. Things start to go gradually off the boil from the seventh and between this hole and the 12th there’s nothing that really sparkles nor anything that I haven’t seen on any number of other top links courses but it remains a stringent test. That’s not to say the centre third is poor or weak, far from it, it’s just that the start and end is so good that in relative terms this section of the course does feel as though you’re going through a bit of a lull in proceedings. The best two holes in this section are the short eighth, with a slightly upturned green, and the 10th where again the burn features prominently. During 2011 I had my first round at Carnoustie and we had the bad idea to play 7000yds par 72 in a cold windy day … We were beaten by KO! I played it 2 more times par 70 and 6500yds which is more fun and still a huge challenge. This year I had my fourth round and after breaking 80 the last 2 times, this one again The Monster won again! It was a sunny, a little bit cold and windy day. The high note on this visit is to have it played again with 11 friends and in a fun match play contest. On the front 9 I hit the ball decently but the putter and very silly mistakes (like unnecessary going for the green on 3) made it a 5 over, on the back 9 ball striking was worse but I battled finishing 3-5-4 for an 82 (11 over). The course was as usual in great shape, since you arrive Club Staff provide a service at the highest level. The Golf Building was under renovation for the 2018 Open Championship but this didn’t mean a loss of quality service, the experience was as usual great and the very nice proshop had tons of nice souvenirs which we of course all bought. Playing not that good will be an advantage because I could tell you what NOT to do or try! Going for the green on 3 is totally unnecessary: chances of success despite having the distance are very little and although the lay up tee shot is tough, the chances of birdie are better (I did birdie 3rd last year). Par 3 8th looks harmless but downwind and with a 9 iron it was impossible to hold the ball on the green, in those conditions hit a shorter club and land it before the green, the only danger is the right side bunker (and OB left of course!). On 11th downwind we could get close to the green again, but bunkers on both sides are too penalizing, so better lay up. Spectacles … into the wind .. 460 yds … driver and 3 wood but it was too low and both “eyes” caught the ball, better lay up and get an easy 5! 17th downwind … both in 2012 and 2016 I drove it over the burn but a slight misshit will be wet so better lay up if you are not 100% sure to go over. 18th is tough, you need 2 good shots to get a 4. If you miss the driver, just lay up. Jean Van de Velde showed how big the disaster can be. As I said in my previous reviews “Carnasty” might not be the nicest, but it is one of the fairest and better maintained links courses in the world. It is a challenge from 1 to 18, no weak holes and no distractions allowed if you wish to score. It is a must play, always. Every St Andrews trip has to have Carnoustie Championship in the schedule. And if you are allowed to get more pics with the Claret Jug the experience is complete, even if you get off 18th gree “Birdie free”!!! Carnoustie is clearly among the best course routings on the planet. Every hole at Carnoustie fits perfectly into an overall mosaic. Unlike an out and back routing such as Troon, Carnoustie offers variety. There is a constant change in direction, which, given the strong wind that is frequently present, is important, so as not to wear a golfer down. The course follows the natural contours of the land. It has some short holes, some long ones, some holes that are easy to drive, others that are quite narrow. It rewards driving but is also a shot makers course. And, its caddies have the best wit and sense of dry humor in all of Scotland. Although Scotland obviously has a lot of great golf courses, I rank Carnoustie first among them. My favourite golf course anywhere. Possibly the best bunkered course in the world, add to that the Barry burn and plenty out of bounds and you have some serious trouble to avoid. The course is however very fair, keep it on the fairway and it is possible to score. Arguably the toughest closing stretch in golf, 13-18 are truly stunning golf holes, each getting more difficult until the last. There is not a single weak hole on the course, and my personal favourites are 2, 6, 13, 14 and 18. The course is always in excellent condition, and the construction of the pro centre extension to form a large clubhouse with an indoor seven bay simulated driving range will compete the package. This is a seriously great golf course. Not the prettiest, but 18 brilliant golf holes. I simply cant believe that there are people out there who think its dull. Didn't play up to its "Carnasty" reputation as played it in perfect conditions, but can only imagine how tough it must play in a stiff breeze. Gentle start followed by a seriously tricky second. Not a classic out and back links so the differing wind is always a challenge. Goes straight into my top 5 and cant wait to play it again in April. The addition of the burns is wonderful, with them seemingly playing a part on every hole. Just go and play it, its awesome. This was my 8th visit to the Craws Nest Tassie and the course is excellent as always - great staff at the offices and pro shop, and the starters and marshalls are all great too. IF I ever get to know another Open venue as well as I know this one I will be a very lucky boy . If YOU havent played Carnoustie - YOU MUST !!! And dont forget the Burnside and the Buddon 18's as well !! Third visit to The Monster and my love for this course is even deeper, the truest test in Scotland together with Royal Dornoch, the best greens and the best mantained course (it was just one week before the Senior Open) and a design that will remain great and challenginf for ever, the course doesn't need to be touched, just mow the grass and let her show the teeth! Again as it was a business trip, on Tuesday afternoon I drove from St Andrews and played it in some nice challenging conditions with rain a couple of times, wind and only sun in the last 3 holes. The day started with a nice lunch at the Carnoustie Golf Club with my good friend Colin McLeod who showed me every piece of history of the Club, which is always nice to learn about. Then with almost no time to warm up and under the rain, directly to play with 3 very noisy canadians. A very rough start and some bad holes on the back 9 but overall a great round of golf on the fairest course you can play. And I had 3 weird situations on the last 3: there is a signal on 16th tee that Tom Watson made four bogeys on that hole when he won in 1975 and in my third visit it was my third par from the same tee! On 17th downwind my drive hit the concrete bridge on the right and ended 56yds from the pin (a 356yds driver!) and on 18th now with some sun I had to hit a 120yds full wedge from the rough to save a great bogey. And after this and my comments to my friends, we decided to go back in 2017. That is what this course has, challenge and attraction to test your game to the limit. The following day on sunny and tame conditions my customers played and I just walked the course but was able to take some nice pictures with the Claret Jug. I will be back and for sure love it even more! Almost flawless, we were fortunate enough to be invited to play alongside a member the week before the Senior British Open. The course is a stern test for any golfer but very fair by rewarding good shots whilst the golf ball was always recoverable in the rough albeit with the expected increase in difficulty. A course planner is provided prior to teeing off and it is wise, if playing without caddies (as we did), to refer to this religiously as bunkers are strategically placed and burns can sneak into play where otherwise you would not be aware of their presence. The greens are as good as you will find anywhere but they aren’t easily conquered so being aware of the pin locations amongst the undulation changes can benefit the better golfer. We were lucky to play on a relatively wind free day but the course was already more than tough enough to challenge any golfer. The final three holes are about as tough a closing three as possible, it is easy to imagine many rounds falling apart at the final (three) hurdle(s). A great experience and the Championship Links at Carnoustie has earned its place sitting very highly in my personal golf course rankings. If you haven’t yet had the opportunity to grace these links with your swing, it should certainly be near the top of your bucket list.